Ideally located close to London’s finest landmarks, the crescent-shaped courtyard is the perfect and elegant outdoor drinks spot. 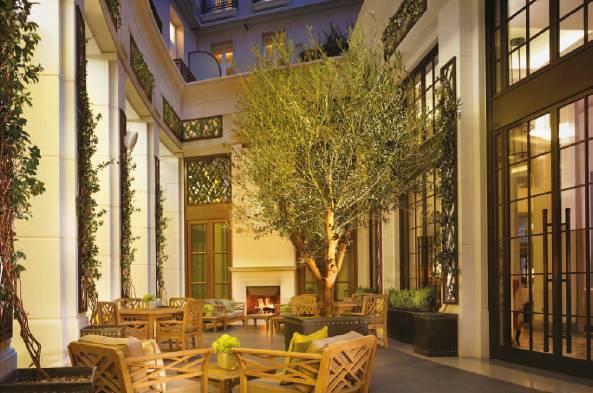 Set in the heart of the newly opened Corinthia Hotel London, the beautiful al fresco setting is a place to enjoy the summer days and evenings complete with under floor heating and a fireplace at either end should the evening turn chilly. Offering a full cocktail list including the Bloom Clover Club made with Camomile Tincture & raspberry pureé, the exotic rum-based Planters Punch and the sophisticated Vesper Martini, cigars and liqueurs can also be enjoyed in The Courtyard. The quintessentially British Afternoon Tea may also be taken in the open-air of The Courtyard where guests can sample sweet treats created by renowned pastry chef Claire Clark, MBE and fine savoury options including gourmet sandwiches devised by Executive Head Chef Garry Hollihead. A special selection of teas from the bespoke Tea Palace menu are presented or for a luxurious afternoon, a glass of Laurent-Perrier Champagne may be enjoyed. The Courtyard is set to be a popular after dinner spot where guests retire for brandy and cigars. With a wide selection of the finest of cigars and brandies as well as other ‘digestifs’, guests can relax in the peaceful and serene setting among the 100 year old Japanese Maple Trees, just moments away from London’s cultural hub. Delicious dining options are also available throughout the day ranging from fresh breakfast pastries and eggs Benedict with a cappuccino right through to oysters and Champagne. The Courtyard is set to be the desired destination for the summer. "These Boots Weren’t Made For Walking."